Implementing the required liquidity risk management reforms has become a twelve-year slog. The Credit Crunch of 2007-8 has been followed by the Great Recession, which continues. Post crisis, central bankers and politicians have intervened as never before with vast dollops of liquidity being injected into economies in their QE exercises. 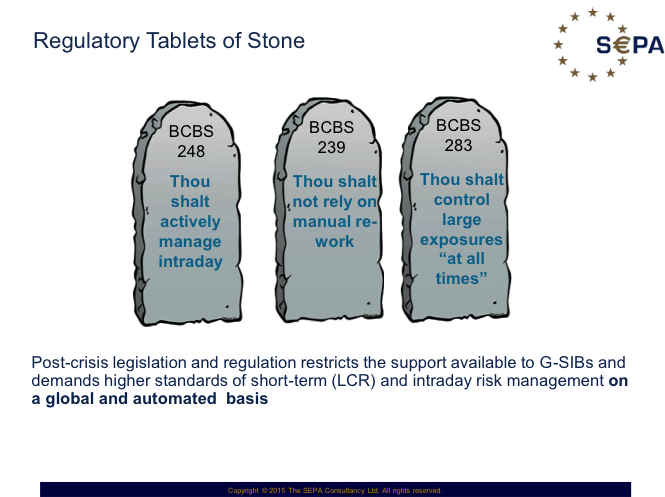 And committees of central bankers at the BIS and the Financial Stability Board (FSB), working to create standards for national supervisors to follow, have piled regulation upon regulation in order to ensure that banks do not over-trade in the same way again. To manage the specific threat caused by the overwhelming effect that a failure of one of the “Too Big To Fail” G-SIBs would have on the global economy. If real liquidity management had become a lost art, it is now an enforced practice. The three main prongs of the regulation have standardised liquidity management practices and levels within all banks. As part of Basel III, new liquidity and capital regulations have been introduced to banks and implemented by national supervisors everywhere. All banks have to observe the standards of (i) the Net Stable Funding Ratio (NSFR) and (ii) the Liquidity Coverage Ratio (LCR), which demand levels of liquidity to be reserved to deal with settlement obligations over one-year and thirty-day periods respectively. Whilst there are longer term deadlines for these, banks (as evidenced by their annual reports) have largely complied with these requirements already. This is not the case with the requirements set out by the BIS for intraday liquidity reporting by all internationally active banks in all of the major currencies in which they operate, to both local and home supervisors. This is largely because banks which use correspondents for clearing their foreign currencies are finding it more difficult to paint a true intraday picture. But paint it they will, and by 2017. Thus you might have thought that the job was done. But it is not. Banks are now being asked to add the belt to the original liquidity risk management braces. Regulators have, not unreasonably, formed the opinion that banks should be monitoring their aggregated risks (foremost of which are liquidity, credit and concentration risks) on a global and aggregated basis. This monitoring may not be real-time, but should be as close to this as can be managed. The keywords in their papers are “intraday” and “timely”. There is an expectation that banks should be able to monitor their intraday risks – across currencies, legal entities and by customer – on a global quasi real-time basis. And none can – today, with any degree of accuracy, during the day. Building the infrastructure to support this is difficult, complex and expensive – working at an angle of 90? to the normal settlement processing functions anywhere in the bank. And that its credit risks with large counterparties in all geographies can be controlled. And all of this to be completed by 2019. To us mere users of the financial system, it may appear unreasonable that it takes 12 years to fix the banking system which was so badly broken. But fixed it will be. The regulators (from the FSB in particular) are intent on completing the regulatory job. Let’s hope that this can be accomplished before the next financial crisis which, if this lot is properly implemented, is more likely to be caused by the asset managers, which hold increasingly large levels of assets, funds and influence. Banks will be less profitable as a result. But they will be less threatening to the global economy. The topics in this note are set out in greater detail in Newsletter 19 on this site, for which you may register.